LOCATION.--Lat 41°17'15.4", long 73°45'13.1" referenced to North American Datum of 1983, Westchester County, NY, Hydrologic Unit 02030101, on right bank 20 ft upstream from bridge on State Highway 35 (Amawalk Road), 500 ft downstream from dam on Amawalk Reservoir, and 1.0 mi east of Amawalk. PERIOD OF RECORD.--Occasional low-flow and/or miscellaneous discharge measurements, water year 1976. March 1994 to current year. GAGE.--Water-stage recorder and crest-stage gage. 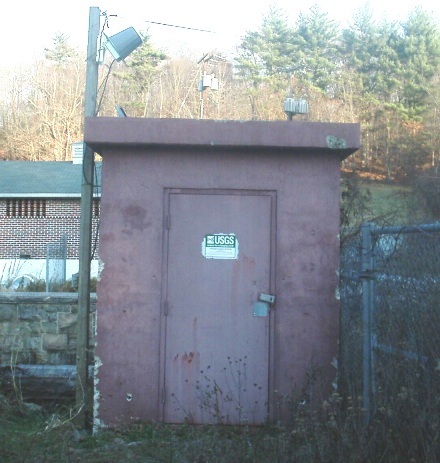 Datum of gage is 314.90 ft above NGVD of 1929 and 313.93 ft above NAVD of 1988 (VERTCON). REMARKS.--Flow regulated by Amawalk Reservoir. Water Years 2014-18: Records fair. EXTREMES FOR PERIOD OF RECORD.--Maximum discharge, 1,440 ft³/s, Apr. 17, 2007, gage height, 12.64 ft; minimum discharge not determined.